Let it snow, let it snow, let it snow!!!!! It has been a wonderful day filled with snow off and on and right now, late in the evening it is coming down nicely! I hope to wake up to a winter wonderland! So, I was not able to score a crate of beautiful local apples! Sad panda 🙁 I went to the 9’s Market this morning. It was snowing and frigid cold and a bit windy. A beautiful morning to me. It’s Christmas week and I am happy & excited! How about you? In a stand mixer, cream together the sugar and butter. Add the eggs, one at a time, until fully incporated, and then add the molasses and vanilla extract. Sift together the dry ingredients in a bowl and slowly add to the egg mixture until evenly combined and a dough forms. Wrap the dough in plastic wrap and refrigerate for at least 30 minutes to 1 hour until firm. Divide the dough into halves and roll out each half at a time onto a floured work surface. 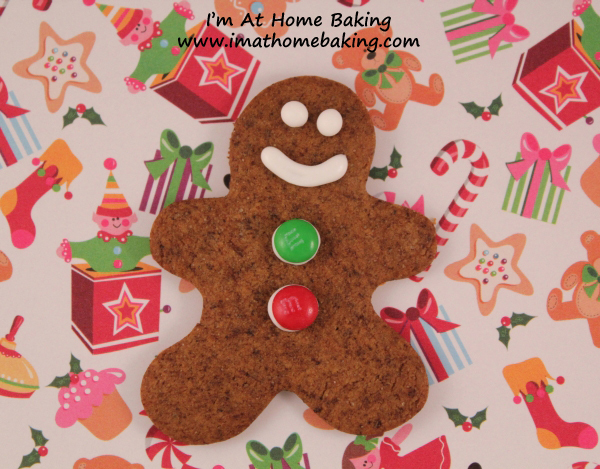 Roll until the dough is ⅛-inch thick and cut out the gingerbread men. Lay them out on baking sheets. Repeat steps with the dough scraps and the other half of dough. Bake in the oven for 10 minutes, until the edges are browned. Make sure cookies are fully cooled before decorating! Decorate using icing, frosting, candies or whatever you would like!